Linda Joy is a Darwin based practicing visual artist. From a young age she was inspired by oil painting and photography, studying the later at the Queensland College of Art in the early eighties. Linda moved to the Territory in 1994 with her three daughters and furthered her practice in printmaking and painting through a Bachelor of Fine Arts at NTU. Some years later, she completed a Bachelor of Education, culminating in her position as Senior Arts Teacher at a local high school for a number of years. She has been the administrator of Darwin Visual Arts Association, exhibited her work in numerous group and solo exhibitions in the NT and Australia, and has been the recipient of several art awards and residencies. Over the last four years Linda has committed to practising full time and is represented by Paul Johnstone Gallery, Darwin. She divides her time between bush camps, family and the studio and is recognised for her unique mark and contribution to the representation of the Northern Territory landscape. Her artistic journey is underpinned by her journals. These are extensive reflections of not only her Australian and international travels, but also the development of her love for the bush and interpreting country. Linda is currently on a six month travelling residency through NSW. 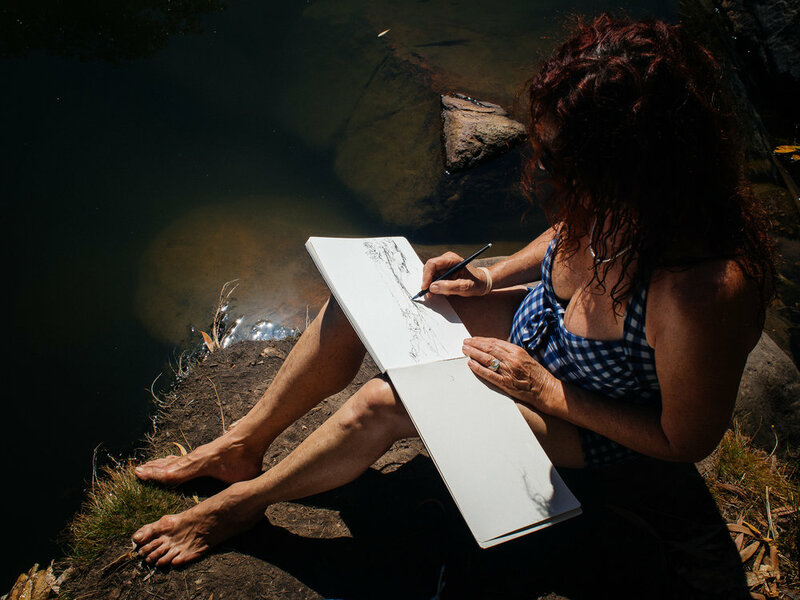 En plein air drawing Top of Gunlom Falls NT.